Welcome to the Christ Church with St. Philip website. 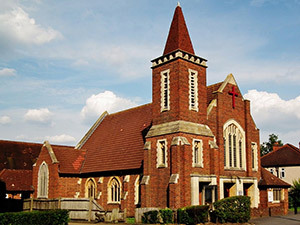 We are a joint Anglican and Methodist Church in Worcester Park in Surrey. We hope that you can use this website to find out about our church, and then come and visit us. Don’t forget to take a look at the “What’s New” section to keep up-to-date with our latest news and forthcoming events.A wide variety of activities for both children and adults takes place in our church and halls each week, including regular worship on a Sunday and Tuesday. The church is also often open during the day for prayer and quiet contemplation. We run a Welcome Café on Tuesdays and Wednesdays, so why not drop in? We also have a range of halls and rooms for hire.If you would like a baptism or wedding at our church, or live in the parish and would like your wedding banns to be read, then take a look at our Baptisms & Weddings page. You can find our church on the corner of Cheam Common Road and Ruskin Drive at the top of Worcester Park’s high street (see map). The 151 and 213 buses stop nearby. If you need directions take a look at our How to Find Us page.